Sold-out houses and standing ovations characterize the performances of the renowned ASPEN STRING TRIO. 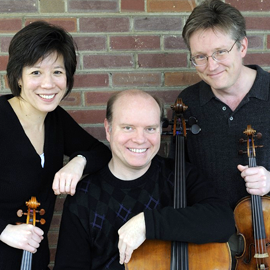 After twenty years of friendship and music-making, Aspen String Trio members David Perry, Victoria Chiang, and Michael Mermagen have joined together as an ensemble with magical synergy. These three world-class instrumentalists each have a long-time association as artist-faculty with the Aspen Music Festival; combined they have performed across the globe in the worlds most prestigious venues. The energy, spontaneity, and sheer enjoyment we find together is a constant inspiration to us, and a joy to our audiences! They delight in offeringwith humor and insightvirtuoso performances of the rich string trio repertoire, including works by Beethoven, Mozart, and Schubert, as well as lesser known blockbuster works by Dohnany, Hindemith, Martinu, Rozsa, Gideon Klein, Veress, Villa-Lobos and Ysaye, among others. Recent and upcoming performances and residencies include Chicago, Arlington and Waco, Texas, The University of Delaware, and Baltimore, Maryland, and at the University of Baltimore where they are the Ensemble in Residence. A notable upcoming recording project includes recording the string trios and other music of Martin? for the Naxos label.